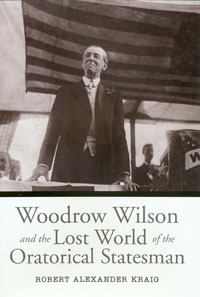 These rousing words of academician Woodrow Wilson foreshadowed the role oratory would play in his own political career—a career that saw him triumph on his domestic agenda largely through his inspirational message but fail in his most cherished dream, the League of Nations, when words were not enough. Robert Kraig’s path-breaking study of Wilson’s political philosophy of the oratorical statesman traces the classical influences on him as a young man, the development of his full- blown scholarly philosophy of oratory, and his use of rhetoric as governor of New Jersey and president of the United States. In the process, Kraig reopens the question of how effective Wilson’s effort for international cooperation might have been had illness not struck him down. ROBERT ALEXANDER KRAIG is presently political director of the Service Employees International Union–Wisconsin State Council. He lives in Milwaukee, Wisconsin.